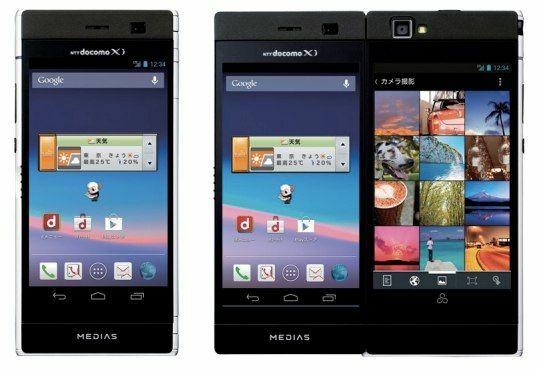 NEC has announced the launch of an interesting smartphone that uses two screens - Medias W. This clamshell device, while is assembled it looks like a normal smartphone, and two screens can be used in parallel after the device is opened. The diagonal of the screens are 4.3 inches and the resolution is 540x960 pixels. Unfolded, one to the other the screens give a total of 5.6-inch diagonal and a resolution of 1080x960 pixels. The device supports the execution of two applications, one on each screen, or uses the larger surface area for a single application. It will be shipped with the Android 4.1 Jelly Bean. Medias W is powered by a 1.5 gigahertz dual core processor (certainly a downside), a gigabyte of RAM, 16 GB of permanent flash memory, and a slot for microSD memory cards. The rear camera has a resolution of eight megapixels, the phone supports LTE mobile networks and has a battery of 2,100 mAh. Sales will start in the Japanese market and are scheduled for the middle of April. The device will be offered via mobile operator NTT DoCoMo. Edition for the global market is also expected, but an official announcement has yet to be.